This quirky comedy based off the stage play is really well done. You have great actors like Jane Fonda and Robert Redford then you have Charles Boyer and Mildred Natwick to add to the mix of comedy, love and life in the big city of New York. The film was directed by Gene Saks and the score was done by Neil Hefti. 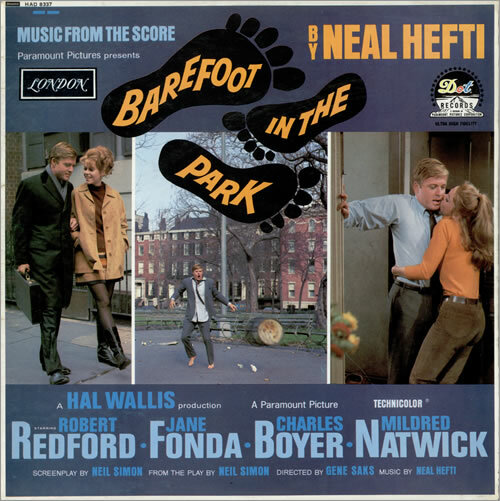 The basic plot is this…In this film based on a Neil Simon play, newlyweds Corie (Jane Fonda), a free spirit, and Paul Bratter (Robert Redford), an uptight lawyer, share a sixth-floor apartment in Greenwich Village. Soon after their marriage, Corie tries to find a companion for mother, Ethel (Mildred Natwick), who is now alone, and sets up Ethel with neighbor Victor (Charles Boyer). Inappropriate behavior on a double date causes conflict, and the young couple considers divorce. So happiness and love along with some great comedy give us a charming movie with a great score. You can find the score on Amazon. This is one of those scores that is only found on Vinyl Record. Can’t find it anywhere else. I have a few great clips though. Well that’s all for today, Hope you enjoyed it, Look forward to my next post on Thursday which is Gambit! Happy Listening!